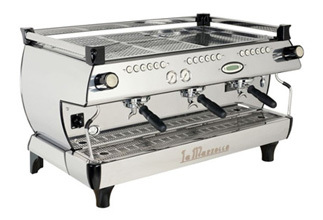 Named for Giovanna Bambi and designed with classical La Marzocco styling and spirit, the GB/5 combines harmonious aesthetics and powerful technological advancements with gracious lines and curves. The GB/5 is an understated companion to any coffee bar, while its unmatched temperature stability provides steady brew water and steam even at the peak of the morning rush. La Marzocco GB/5 boasts a dual boiler system, saturated group design, PID temperature control, LCD display & button programming interface.